I am addicted to my morning protein shakes! I eat the same, exact thing for breakfast almost every single morning. Whether it’s summer time and hot outside, or freezing cold like it has been lately, I still choose to have one each morning. It is filling, it’s delicious, and it meets my personal fitness and wellness goals. 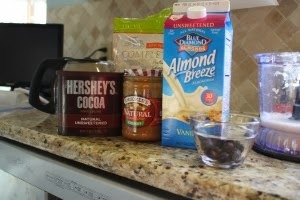 I have experimented with many different recipes for these shakes and used many different protein powders. I’ve had some amazing ones, and some not-so-amazing ones . My favorite is the Chocolate by Momsanity. You can order yours from my affiliate link HERE. This is the one we use in my home—all four of us! I thought it would be fun to share my favorite version with y’all in case you have been looking for a delicious version to start with. *1 scoop protein powder- I use Chocolate. I also like to pour in about half a cup of my coffee from that morning. Totally optional. But delicious. *Crushed ice. The more you add, the more like a ‘slushy’ it will be. Put all in your blender and blend. And be ready to have your mind blown. This shake is so good that I have to make M his own portion of it or he will try to drink all of mine. It keeps me full until my morning snack. 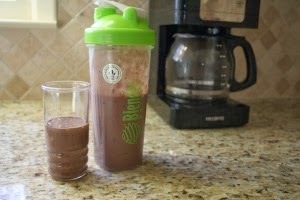 This shake is NOT low-calorie, so if you are watching your calories, this may not be the best version for you. I do not watch calories, but look to eat nutritious, whole foods high in protein and fiber so this fits my personal goals perfectly. What brand of protein powder do you use? I'm trying out some different kinds. I love to make shakes similar to this with frozen bananas. I think bananas give the shakes a really nice consistency. The taste is not terribly strong if you don't like bananas and you can add the protein powder, fruits, and peanut butter to give it the taste you want. I peel ripe bananas and wrap them in foil and place them in the freezer. Use within a week to avoid the banana turning brown. You can experiment a little with how long you can freeze them! My family loves your protein bites. I make the newest recipe and keep them in the fridge for a healthy snack or breakfast.